The covered buttons on Ottaviano Grimani’s shirt jumped out at me when I came around a corner and looked up at the huge painting. Of course I couldn’t find a copy online that conveyed the stunning quality of the buttons, but the search was instructive. This portrait by Bernardino Licinio was in the Masters of Venice show of 50 paintings that came from a collection that the Habsburgs assembled in Vienna, works of Venetian artists of the High Renaissance, mostly the 16th century. Since I haven’t paid any attention lately to what is going on in San Francisco, I would have missed this opportunity altogether if my friend “Lorica” hadn’t invited me to go just before the show closed. I loved that it was small and focused — we didn’t visit any of the permanent collection — so that my easily-overwhelmed brain could stay calm and receptive as we slowly moved from one room to another of the De Young Museum. 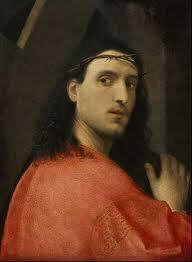 The time flew, as Lorica elaborated and added to the information posted near the paintings. I am woefully ignorant, and she was the perfect guide for someone like me, who can’t chew very big auditory bites. It seems somehow shameful, but I am doing it anyway: posting some of my favorites here in truly pathetic versions of themselves. As soon as I came home I looked for them on the Internet so I could show my husband, and as it had been only a couple of hours since I’d seen the masterpieces in their glory, I was terribly saddened to see that aspects of the originals that had given me so much pleasure were flattened to the point of extinction. That was an Aha! moment, as I contemplated the truly 3-D nature of paintings. And I realized why one would want to visit a show like this several times — because looking at the little postcards one can bring home is a sorry substitute for Being There. 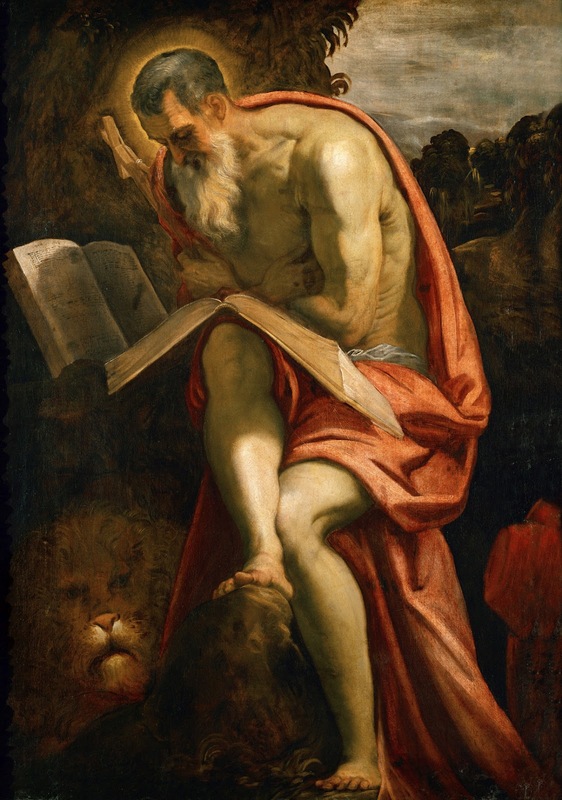 The first thing I noticed about St. Jerome, who translated The Vulgate, was his smiling eyes. He must have been so happy to be reading God’s Word. (Lorica told me that he was known to be grouchy.) And the face of the lion was lovely, Aslan-like. Neither of those endearing features comes through in this little copy. 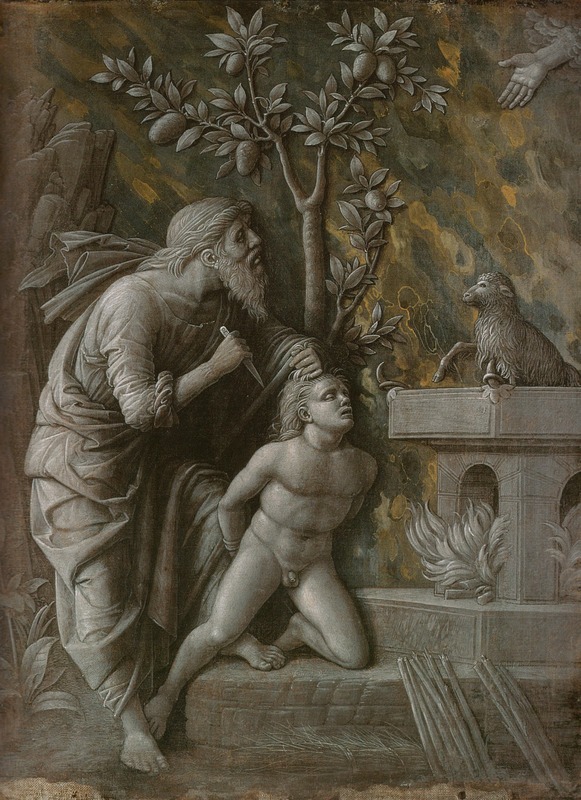 At left is The Sacrifice of Isaac by Mantegna, which I loved. 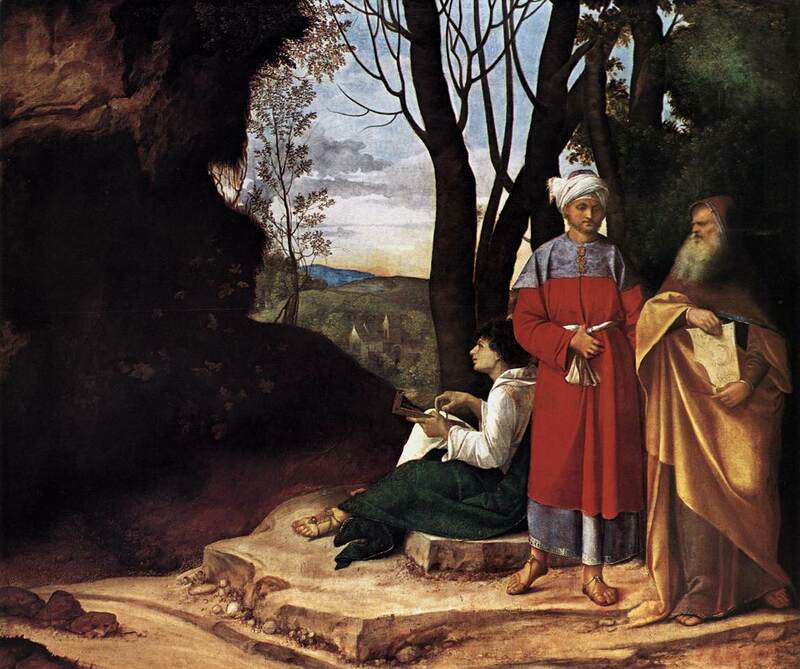 The whiteness and statue-like quality of the painting was new to me, and the whole composition so complete in its portrayal of the event, and with beautifully “carved” figures. The little ram presenting itself, God’s hand presenting it…. One painting of which I could only find a decent representative online a few years after writing this post was Titian’s Entombment of Christ. I have inserted it in an update. My guide pointed out to me that it seems to be all about Mary, as she and her richly blue cape are the focal point of the composition. 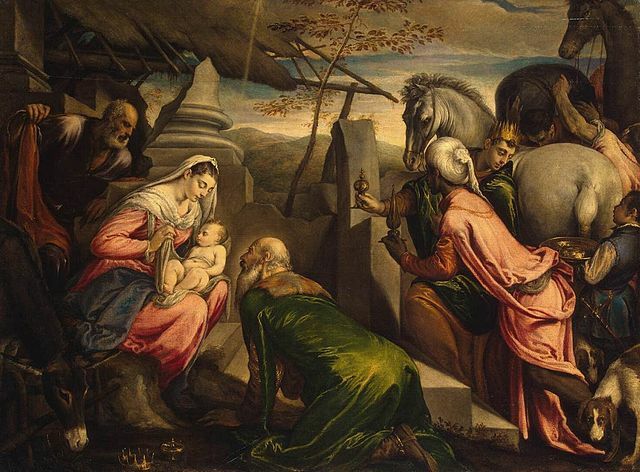 Another Biblical scene, Adoration of the Magi, by Bassano the Younger. I think it’s charming in the way it depicts the bustling arrival of the worshipers and how the man in green wastes no time in getting as close as possible to the Christ Child. Some of the other artists whose paintings we saw were Veronese and Bordone, and Pordenone, whose Christ With the Cross (below) admittedly a very Italian version of our Lord, is still quite arresting, and keeps my thoughts on the Love of God. Looking at the little pictures here, remembering the great works that I had so recently wondered at — it all made me think I hadn’t been paying enough attention while we were in the museum. After all, it was the chance of a lifetime, and I had been so casual, strolling around dully as though I could just hop over to Vienna anytime I wanted and see the paintings again. One can see that I need to get to the art museums more often, and that my education in art appreciation has barely begun. I've always enjoyed the deYoung museum. We lived in the bay area for many years and went to “the city” for Art appreciation classes all though school. I loved looking at the “real thing”…what a privilege!